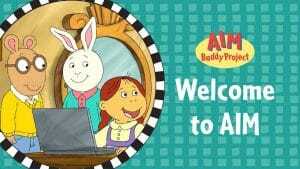 The Arthur Interactive Media (AIM) Buddy Project is an innovative, research-based program that leverages the power of the beloved PBS Kids series Arthur, interactive technology, and cross-age buddy relationships in elementary school classrooms. The AIM Buddy Project includes five units, each of which concentrates on a different topic: empathy, honesty, forgiveness, generosity, and learning from others. Each unit features an online comic or game, based on an Arthur episode, along with related non-digital activities for students. WGBH – producer of Arthur – and the Institute for Applied Research in Youth Development at Tufts University worked together to develop and test AIM program components, culminating in a year-long research study during the 2015-2016 school year. Study participants included 90 teachers and 1,155 students in first and second grades (known as “Little Buddies”) and fourth and fifth grades (known as “Big Buddies”). Results showed that Little Buddies who participated in the AIM program in high fidelity programs had statistically significant increases in their empathy, future-mindedness, and positive perceptions of their classroom climate. They also showed that both Little and Big Buddies who participated in the AIM program in high fidelity classrooms had statistically significant increases in their levels empathy and tolerance. To learn more about these findings – and additional results of this extensive study – click here. The long-running series Arthur airs weekdays at 5:30 p.m. as part of the CPTV Kids lineup.